On 22 August, China’s leading online education company, Hujiang EdTech (“Hujiang”), officially announced its strategic cooperation agreement with the Foreign Language Teaching and Research Press (“FLTRP”) and New Oriental Education & Technology Group (“New Oriental”). The three giants will join to establish Innova Press Limited (“Innova”) in the UK, a publishing company focusing on overseas copyrights in the education industry. Cai Jianfeng, President of FLTRP, Michael Yu, Founder and Chairman of New Oriental, and Arnold Fu, Founder and CEO of Hujiang EdTech attended the signing ceremony in Beijing, as the official representatives of the trio. 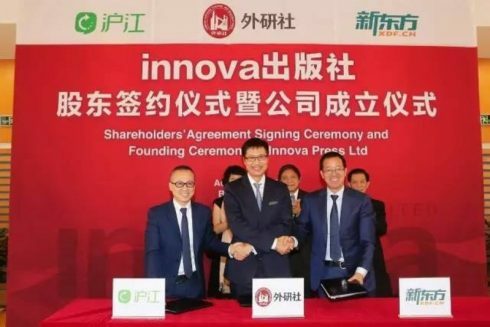 Innova is a UK-based innovative publishing company, co-founded by FLTRP (UK), a wholly-owned subsidiary of FLTRP, Hujiang, and Elite Concept Holding Limited, a wholly-owned subsidiary of New Oriental. It aims to help students around the world to better prepare for study or work in English or Chinese, and to provide matching training and support for global educators. It also commits itself to publishing quality innovative products about China and Chinese culture for English-speaking readers, leveraging the resources of the three shareholders. According to the 2017 China Digital Publishing Industry Annual Report, the annual revenue of China’s digital publishing industry last year was over 570 billion CNY (nearly 86 billion USD). With a market size of over 100 billion CNY, the digital education publishing is accelerating at a rapid pace and is increasingly playing a critical role in the digital publishing industry. Apparently, the growing need for online education and digital education publishing stems from the pursuit of high-quality teaching content among domestic users. Hujiang provides multilingual courses used in almost 200 countries and regions. It has the most comprehensive e-learning matrix in the industry and has established a complete ed-tech ecosystem, raging from the huge web traffic attracted by free e-learning materials and tools, to high conversion rate brought by quality resources on HJCLASS (Hujiang Online Class), a massive online course platform, and CCtalk, an interactive online teaching platform. In recent years, tens of thousands of teachers as well as institutions and publishers have benefited from the Hujiang platform, including Cambridge University Press, Oxford University Press, McGraw-Hill Education and Harper Collins Publishers. At the ceremony, FLTRP designated the British core management team for the operation of Innova. He Haoyu, Vice President of FLTRP and Chairman of the Board of Innova, issued a letter of Appointment for President of Innova to Richard Peacock, a British professional manager. In his inaugural speech, Mr. Peacock detailed the mission of the new company, and demonstrated his confidence in making it an innovative publisher in the UK targeting global users.